The Report Browser is a new feature that enables People Inc. users to review the report templates that are available as free-downloads from the People Inc. website. 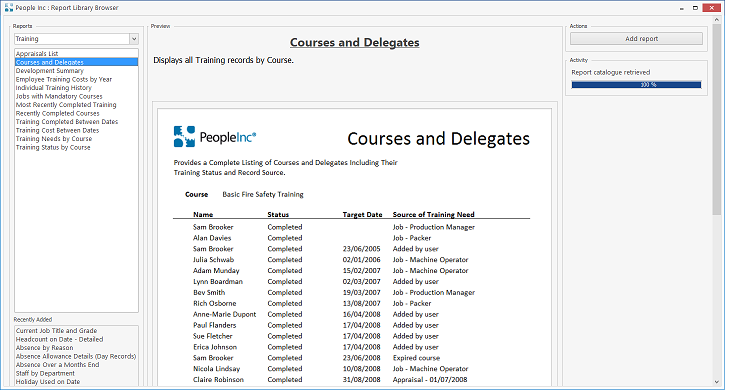 Users can then select and install individual report templates for use within their People Inc. system. The standard People Inc. system includes around 200 report templates. These can be found in the Report Library within the system. For some time it has been possible to download additional report templates and import them into the Report Library, but until now this has been done manually. The Report Browser plug-in automates the process and provides users with quick, easy access to around 200 additional reports. The plugin is loaded from within the People Inc. system. A list of the reports available on-line is provided in just a few seconds. It is possible to install the plug-in but control who has access to it (using standard People Inc. security profile functionality). The user can browse through the online report library, category by category. A description and preview of each report is provided as the user moves between entries. The reports can be downloaded and installed within People Inc. The user is able to choose whether to add the report to the Report library or to an individual data screen. The plug-in provides a list of report templates that have been added recently. While users can still create their own report templates using the People Inc. report writer, a much wider variety of reports is now available to users who have not yet learned to use this tool. As new report templates are developed (either as standard offerings, or commissioned via the People Inc. report-writing service), these will added to the on-line library and will therefore be available via the Report Browser plug-in. The plug-in displays a preview for each report template. This makes it easier to understand what the report is designed to do (and how it will look). To book a place on a Webinar please contact your account manager either by telephone or e-mail. A copy of the Report Browser plug-in can be downloaded (and installed) free-of-charge from the Resources area of this website. Once downloaded, you are likely to need to ask your IT team to install the plug-in for you. Please note that you will need to register for an account before you can access People Inc. resources. Click here.